There’s nothing like the excitement you experience when you come across a delectable-looking mushroom on a walk in the woods, or even discovering one in your backyard! In Southern Oregon, the mushroom that seems to be on everyone’s minds is the elusive but delicious morel. But before your mouth starts watering too much… can you explain what a mushroom is, and how it is different from a plant? On Saturday, April 6, the Friends of Cascade-Siskiyou National Monument, KS Wild, and the Siskiyou Chapter of the Native Plant Society of Oregon teamed up to offer a hike for mushroom enthusiasts to learn the answers to these questions, and to see what types of fungi we could find living in the Cascade-Siskiyou National Monument. Guess what? We found More than Morels! Bashira Muhammad is a mushroom farmer and the founder of Zoom Out Mycology, a local company based in Ashland that helps people grow mushrooms and teaches fungi-centric environmental education programs. As our guide, she encouraged us from the beginning of the hike to resist the urge to harvest the things that we found, and instead take this opportunity to make observations and see what we could learn from them. We were also encouraged to think about our impact on the landscape during our hike, and how we could be good stewards of the land during our visit. One example of this is replacing the logs that we rolled over in search of fungi. This hike took many of us to a part of the Cascade-Siskiyou National Monument that we had never been before: an area off of Emigrant Creek Road, just north of Buck Rock. On our hike, we traversed between multiple different habitat types with varying microclimates: warm, open oak savannas and cooler, mixed woodlands with more conifers and lots of shade. In the more open, warm oak savanna, we discovered bird’s nest fungi, a member of the Nidulariaceae family. This fungus gets its name from the tiny fruiting bodies that resemble eggs inside a bird’s nest. In the mixed woodland, we came across another exciting find: a false morel! False morels are members of the genera Gyromitra and Verpa, not to be confused with true morels, which compose the genus Morchella. We learned that true morels have hollow stipes (stipes are the “stem” of the mushroom), while false morels have stipes that are filled with fibers or chunks of tissue. False morels contain a toxin that if ingested, can lead to illness and even death. Bashira impressed upon the group the importance of not harvesting or eating anything if we aren’t sure it is an edible mushroom. After making careful observations of each mushroom we found, we were able to deduce that mushrooms are not members of the plant kingdom, but are instead a member of the kingdom Fungi. The two main differences between fungi and plants are 1) fungi cell walls are composed of chitin (the same material that makes up insect exoskeletons! ), while plant cell walls are composed of cellulose, and 2) fungi do not make their own food using photosynthesis. Instead, a fungus gets its food from non-living organic matter, breaking it down and releasing nutrients back into the soil. While we did not end up finding any true morels on our hike, we discovered a huge diversity of fungus among us. In addition to the false morels and bird’s nest fungi, we found turkey tail, puffballs, jellies, cup fungi, and a few gilled mushrooms. The diversity of fungi that we found in such a short time got us thinking: What mushrooms would we find if we returned next week or next month? And how many more species of fungi call the monument home? There is so much more exploring to be done! “More than Morels” was the first of a series of spring hikes planned collaboratively between KS Wild, the Friends of Cascade-Siskiyou National Monument, and the Siskiyou Chapter of the Native Plant Society of Oregon. Join us as we continue to chase the wildflowers through the elevations in our backyard monument! For more information about the next two hikes in this series, visit KS Wild's calendar of events. 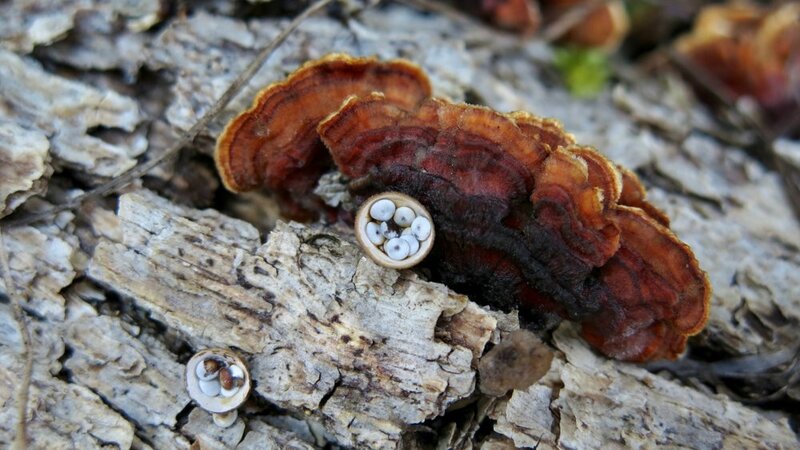 Bird's nest fungi and turkey tail in the oak savanna. Bashira looking at the stipe of this gilled mushroom. False morel found in the shady mixed woodland. Bashira showing us how to use a fungi ID guide in the field. Mushroom enthusiasts of all ages joined us!